This is Part 4 of a series. See also Part 1, Part 2, or Part 3. Here we go again, dear readers. Whew, this series of posts is even longer than my exhausting blog series on Comcast and number portability regulations. And there are more cute wildlife pictures. Episode 32. 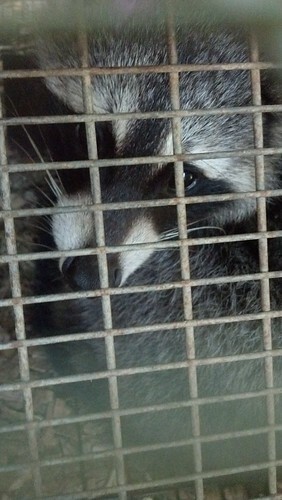 Mr. Nonchalant Raccoon (from Part 3) was released from Trap #2 and immediately walked around the building to be caught by Trap #1. We signed a contract with Critter Control promising not to touch their traps (we have two traps, they own two traps) so he’s in there overnight at least until the guy comes around again. And Raccoon ate the apple. Check it out — he doesn’t even care that he’s locked up. Here he is reclining on his back and staring boldly at me. Episode 32-a. 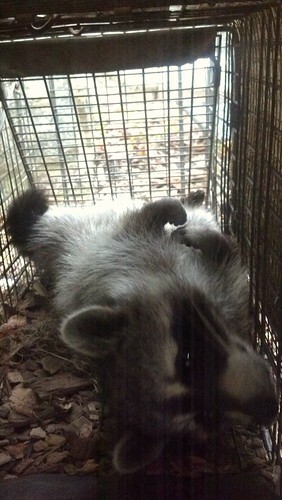 I put it to you that this raccoon has been institutionalized. This raccoon has a prison mentality. 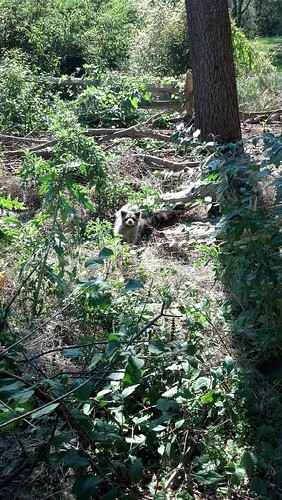 According to Bartol & Bartol’s “Psychology and Law” (or at least these random notes from it that I found on the Internet when I searched for “prison mentality”), this raccoon has entered the stage of institutionalization syndrome where he “loses interest in the outside world.” He exists only within the confines of his incarceration. He lives only for our apples. Maybe. Episode 33. Indeed, we release Mr. Nonchalant Raccoon and he doesn’t exactly try to go back in the cage, but he does saunter slowly around the house, even coming toward us at some points. Sorry this is blurry but you see what I mean. 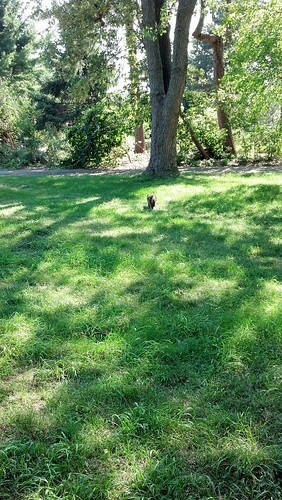 Finally Mr. Nonchalant Raccoon walks (slowly and deliberately) to a nearby grove of trees. According to Bartol & Bartol, this raccoon may be “longing for jail.” He may miss structure. He may be considering ways to re-offend so he can “get back inside.” Stay tuned. 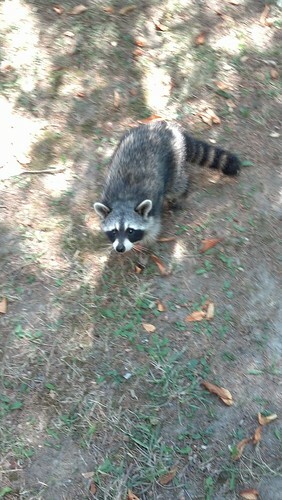 Raccoon sits in the bushes and stares at us. It feels like a “If you’re going to watch me, I’m going to watch you too” thing. Specifically, he watches us catch another groundhog. Raccoon is learning the system. Episode 34. Yes, just as soon as Trap #2 was vacated by Mr. Nonchalant Raccoon, it caught another groundhog. This is groundhog #3 and he is a young little groundhog. 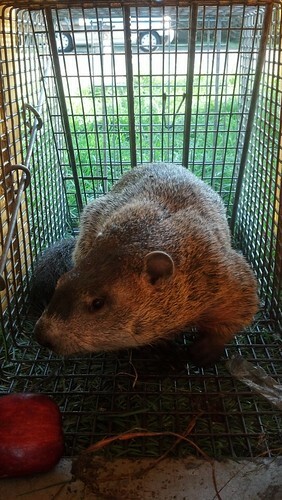 The Critter Control guy says he estimates this groundhog at less than 1 year old. This little guy is quite cowed by the experience and mostly just pauses to consider the apple. Episode 35. I am becoming somewhat tired of writing about this but the opportunities to take my own close-range animal pictures are exceptional and that keeps me going. Also the groundhog trapping seems to be getting us some pretty nice goodwill with our neighbors. The super fat one from a few posts ago was apparently public enemy #1 on our block. He was widely known for his habit of sunning himself lazily on his back while eating your each of your ripe tomatoes, one at a time, using only one paw. His departure has been widely celebrated. Continue to Part 5 of this series. This entry was posted on Monday, September 3rd, 2012 at 12:18 pm	and is filed under Groundhogs, Living. Bad Behavior has blocked 1537 access attempts in the last 7 days.